On the last day of the year 2016, we began our journey early in order to explore Bhopal and around to the maximum extent possible. 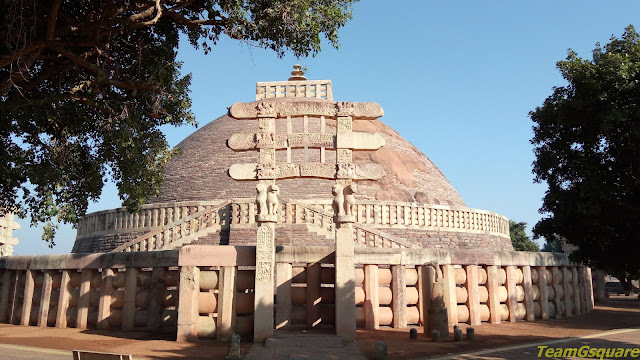 Having explored many interesting places like Bhimbetka, Ashapuri and Bhojpur the previous day, we awaited the exploration of Sanchi with equal curiosity. Sanchi was always on our wish list of places to visit as it is proudly one among the UNESCO World Heritage Sites in India. 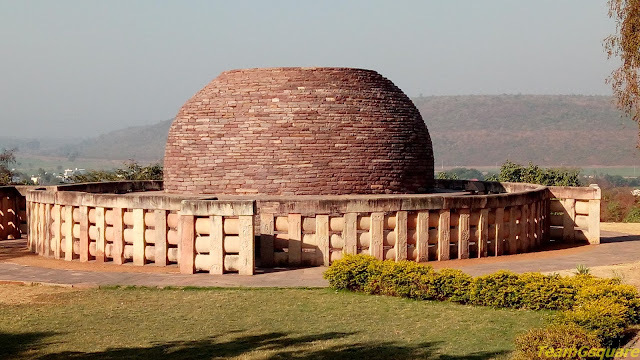 Sanchi is located in Vidisha district of Madhya Pradesh and is situated close to the Tropic of Cancer, which is encountered on the Bhopal-Sanchi highway. Unfortunately, we missed the exact location of the Tropic of Cancer and weren't ready to travel back. A drive of around 50 minutes from Bhopal brought us to Sanchi. 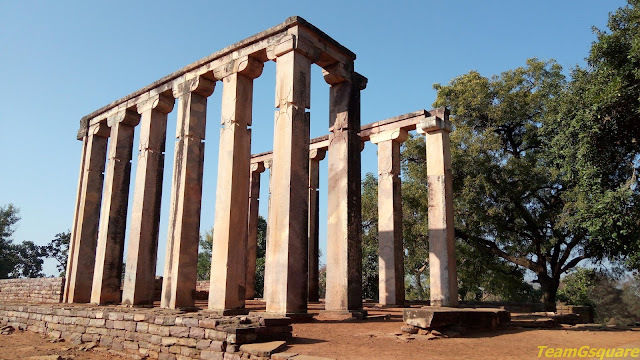 We were one amongst the few early visitors to this place and as the crowd was thin giving us an opportunity to enjoy the calm and serene environs of Sanchi. Sanchi is one of the few places that played a pivotal role and prevailed through out the Buddhist era in India, with its history spread across 1300 years. 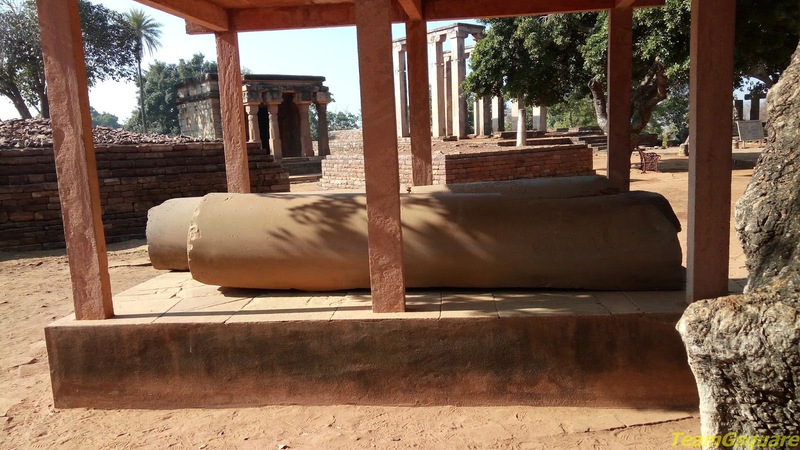 Sanchi has witnessed the genesis, rise and fall of Buddhism. There are many stories associating Sanchi with various kingdoms, right from Ashokan era to the reign of Paramaras. Sanchi seemed a perfect site to build the Stupas owing to its strategic location between the towns of Vidisha and Ujjain and its proximity to the place of confluence of Bes and Betwa rivers. 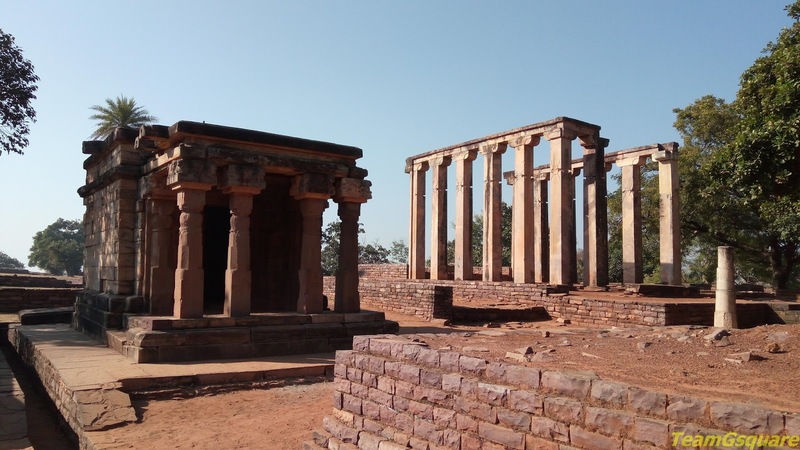 Post Ashokan period, Sanchi came under the control of Kshatrapas which was conquered later in 4th century AD by the Guptas. 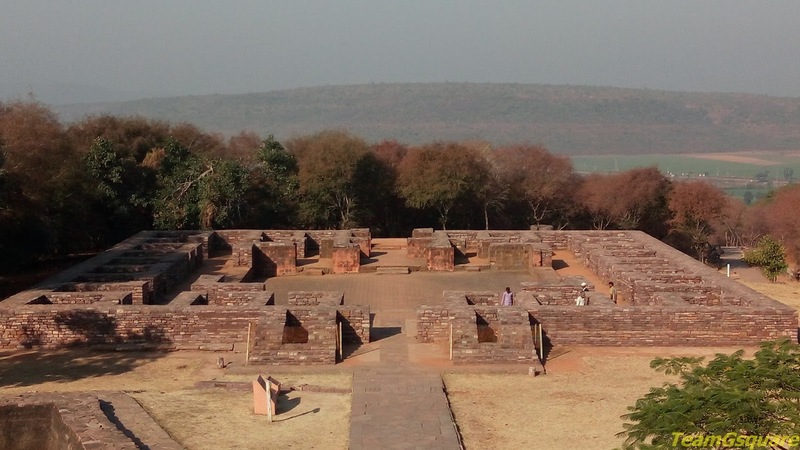 Sanchi regained importance under the Gupta rule with development and construction activities progressing in full swing. 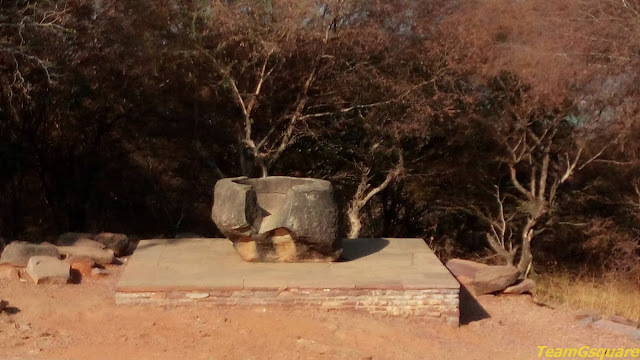 The down fall of Sanchi began only in the 12th century AD and the exact reason for its downfall is unknown and remains a mystery. 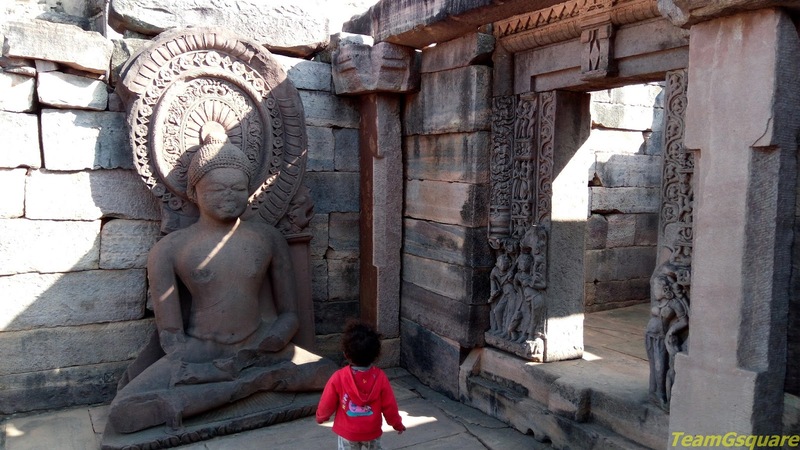 Though the accepted theory is that the rise of Brahmanism led to the extinction of Buddhism in the land of its birth, the same may not be true, since there are evidences of places like Ellora and Badami, where both the religions of Hinduism and Buddhism peacefully coexisted for several hundred years. In 1881, General Taylor discovered the ruins and found a few intact stupas, thus bringing this place to light. Though many people visited this place later, it was only in 1881 that Major Cole took charge and initiated a large scale repair work towards restoration and preservation of these monuments. It was Sir John Marshall, the then Director General of Archaeology in India between 1912 and 1919 who was responsible for restoring Sanchi to its present condition. Various excavations carried out later by the Archaeological Survey of India (ASI), Bhopal circle, have made interesting revelations. Stupas are simple tomb like structures housing relics, better than burial tombs which were used by Buddhists and Jains. 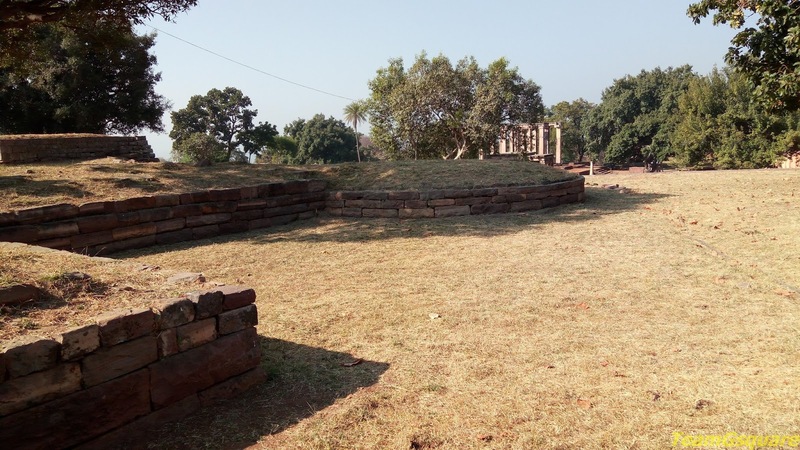 A Stupa generally comprises of torana/s (gateways), vedika (stone fence railing), pradakshina-patha (circumambulatory walkway), a cylindrical base or foundation, stairway, medhi (upper pradakshina patha), anda (hemispherical flattened dome), harmika (kiosk), yasti (mast) and a chattra (spire/umbrella). When Buddha left for heavenly abode, his ashes were buried in eight different stupas. 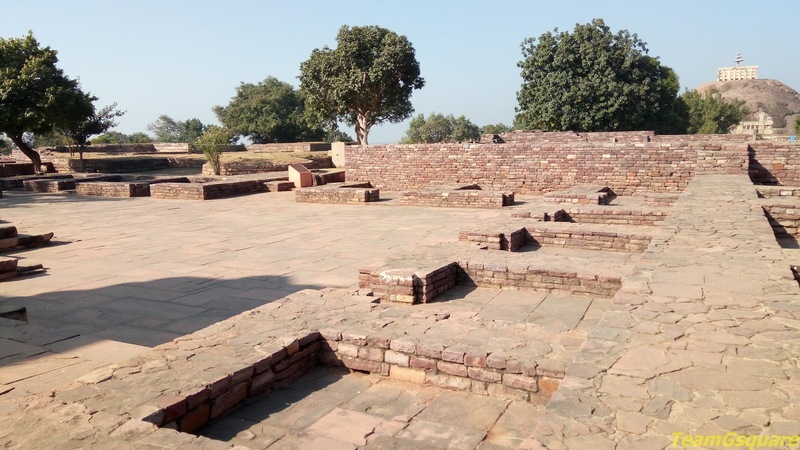 It is said that Ashoka further divided and placed them in 84 stupas, most of which have vanished with the weakening of Buddhism. Stupa 1 and Toranas - The largest stupa here is stupa 1, also known as the 'Great Stupa'. 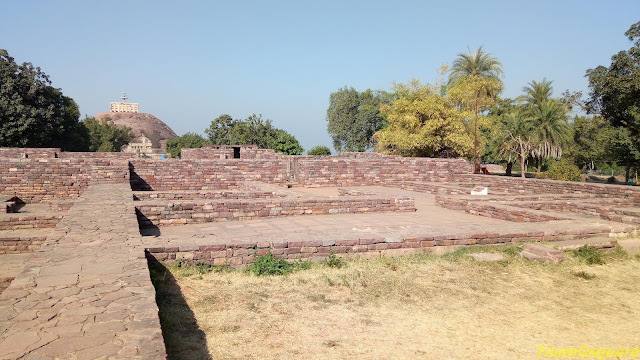 Though the size of this stupa was originally half its current size when initially built during the Ashokan period, it was later improvised in the 2nd century AD during the reign of Shunga Dynasty. The four gateways here have magnificent toranas (gateways) belonging to 1st century BC. The gateways are in the form of three long and thin flat suspended stones standing on two pillars, portraying scenes from Jataka tales. Various scenes from Buddha's life and the subsequent history of Buddhism are depicted on the gateways here. The gateways of stupa 1 are truly an outstanding work of art on stone. This Stupa has a large dome with a three tiered chattra or umbrella at its top. Stupa 3 - Situated very close to stupa 1, this stupa is much smaller and simpler in style with the presence of a single torana in its front and houses a simple umbrella at its top, unlike stupa 1. Stupa 2 - Situated at the foot of the hill, this stupa is similar to Stupa 3 with smaller dimensions and devoid of any torana. The chattra here lies broken. 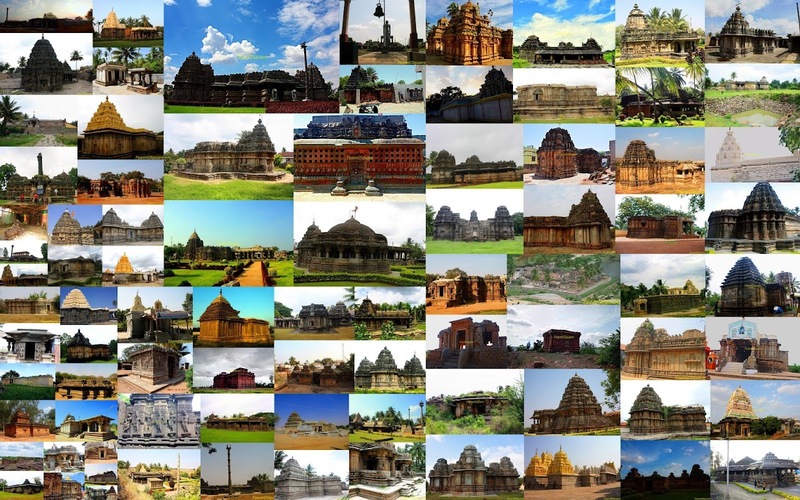 Temple 17 - This belongs to the Gupta period (5th century AD) and is one among the earliest temples of India. The temple is flat roofed with a square sanctum having a portico supported by 4 pillars. Temple 18 - This is an apsidal shrine built in the 7th century AD on the earlier remains of a hall belonging to the Mauryan empire. The temple has undergone restoration during 10th century AD with an addition of carved door jambs. Monastery 51 and the Stone Bowl - Monastery 51 is a large ruined structure comprising of various rooms surrounding a courtyard. The shrine was located right across the entrance. There is a giant stone bowl close by to this monastery. Monasteries 46 and 47 - These two monasteries are interlinked with each other, Monastery 47 being the larger of the two. While Monastery 47 has many rooms, a pillared verandah that leads to an antechamber and a shrine, Monastery 46 has fewer rooms and can be reached through a doorway from the verandah of Monastery 47. Temple and Monastery 45 - This temple belonging to the medieval period was originally built during the 8th century AD along with the monastery and probably restored during the 11th century AD. The door jambs of this temple have beautiful carvings depicting the river goddesses of Ganga and Yamuna. Pillars - There are many pillars here of which, Pillar 10 is the most important and the oldest pillar erected by Ashoka. While only the base of the pillar remains insitu, the fragments of the shaft are placed in a shelter nearby and its capital is preserved in the museum. Pillar Nos. 25 and 26 belonging to a later period also bear significance. Building 43 - This ruined building having a peculiar round bastion at four corners, is considered to be among the last built structures here. 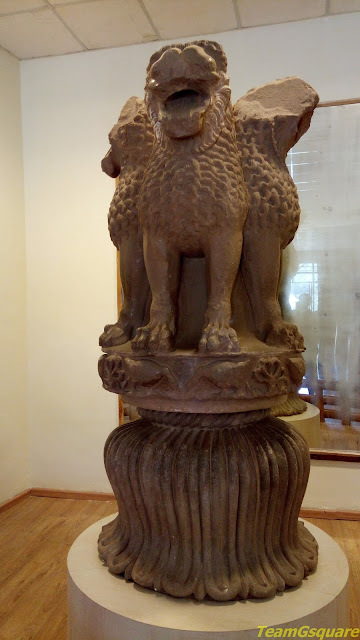 ASI Museum - The Museum is situated at the base of the hill and houses various collections of artefacts found during excavations at Sanchi. Entrance Fee: Rs.30/- per head for Indian citizen and Rs.500/- per head for others. Entry is free for Children aged up to 15 years. Accommodation: Options for accommodation are few, with Gateway Retreat maintained by MPSTDC being a reasonable one. Alternatively, one can also stay at Bhopal overnight. Where to eat: While there are many roadside eateries here, Hotel Sambodhi International is one of the better options. Beautiful images of the way it used everyday. Fantastic. Its a wow post,so many infos with beautiful shots,loved reading. It is marked for future . well written post with information and grand pictures . Buddhism occupies a prominent role in our history. I don't agree too that it would have had any conflicts with Hinduism. Anyway, good to see so many Stupas and learn about the ashes of Lord Buddha being there. Such a long history and amazing site. Those Stupa,1,2,3 are beautiful. Good to know that they have been well restored.